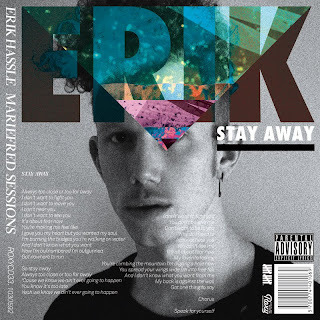 Erik Hassle's new Kent-produced mini-album "Mariefred Sessions" makes debut at #11 of Swedish chart - not bad result for young talent but hopefully it's just a beginning. Erik has already presented few of his new tracks earlier this year and taking into consideration that album contains 6 tracks we've already heard half of them. After listening to whole album I'm not gonna say there's as much of Erik as Kent. Yes, electonic sound of "Sometimes When It Rains" with dark keys and filtered Eric's voice feels like something we heard on the latest Kent's albums. Yes, acoustic guitar-driven radio-friendly chorus of "Stay Away" feels like something from previous pop-rock Kent's era. Yes, Joakim Berg's vocal could easily be layed behind heavy synths of "Stains". But however in common it's Erik's personality prevailing in every key and every sound of this album and passion he has put into this album becomes strong link between two music worlds never crossed before. "Stay Away" will be released as the second single and Erik plans to make video for it, good choice for the single but I hope we'll get some more this Summer. You can check both "Stay Away" and "Sometimes When It Rains" below though there's huge possibility some other album track will inspire for new article. Or two. i was listening to this on the way to work this morning. it's quite good actually. i do like Erik as a popstar, i just wish he'd get a bit more success!! He will, he must. Just one album and international audience has fallen for him, second album and the most popular Swedish rock-band writes songs for him. This guy is made for success!